Use Lawry's Asian Ginger Garlic Chile Rub to add exciting Asian flavor to your everyday cooking. This Asian inspired rub includes the classic flavors of Ginger, Garlic and a mild Chile Pepper heat. 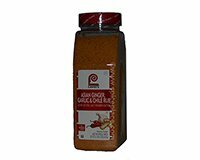 Enjoy this Asian rub with Poultry, Pork, Beef and Seafood. As with all of the Lawry's Rubs, the Asian Rub include Lawry's signature "crust" that adds both a visual and textural appeal.